Developing your own 3D game engine can be a demanding task. 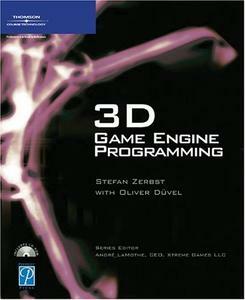 If you?re up for the challenge, then “3D Game Engine Programming” is ready to take you through each step. All you need to begin is a working knowledge of C or C++and basic knowledge of the DirectX and Direct3D interfaces. With these skills behind you, you?re ready to tackle the mathematical concepts and API-independent interfaces that will add up to your working game engine. This book takes you beyond simply building your game engine, showing you how you can apply it to implement a network deathmatch first-person shooter. You?ll also cover additional tasks such as implementing a level editor to build your own 3D levels from scratch with a graphical user interface.